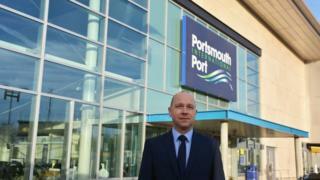 Image caption Portsmouth International Port director Mike Sellers says the government is "not accepting there is going to be a potential issue"
The government has provided only 10% of the money needed for no-deal Brexit plans at Portsmouth, according to the channel port's director. Mike Sellers said contingency plans would cost £4m, but the Department for Transport (DfT) had provided £345,000. He said the government was "not accepting there is going to be a potential issue at Portsmouth". The DfT said the estimated risk of disruption did not warrant extra funding. Mr Sellers said delays at the port, which could be caused by post-Brexit customs checks, could cause congestion across Portsmouth and supply issues to the Isle of Wight and the Channel Islands. He said there were currently only 13 lorry lengths between the port and the motorway. This would be supported by two new lorry triage processing points, on the edge of Portsmouth and on the A31 near Winchester. He said: "There has been a lot of work in the port industry to prepare for the worst case. "I am confident we will be Brexit ready whatever the outcome may be, even a no-deal. "The issue at the moment is around the funding not the preparation." He said 95% of food and medical supplies consumed on the Channel Islands came through Portsmouth, and a 48-hour delay to freight services could see supermarket shelves empty on the islands. A DfT spokeswoman said: "The government will consider a claim for support should the local authorities find themselves in a position of financial hardship following the implementation of mitigation works."